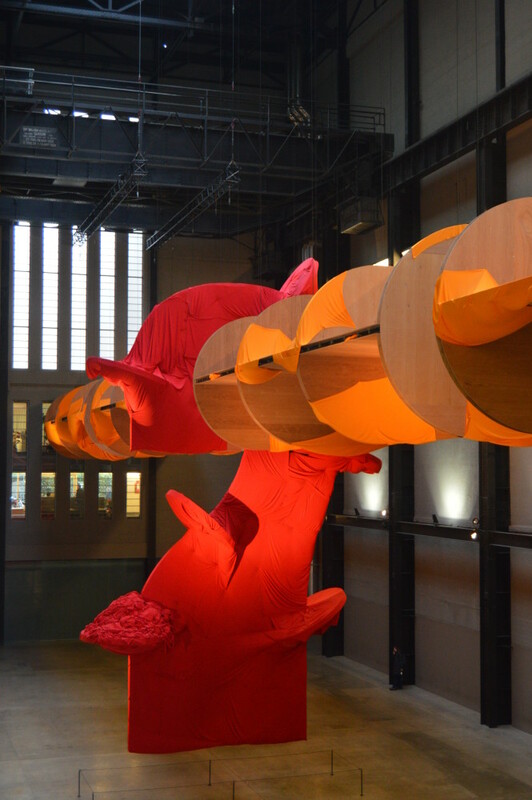 The chasm of the Tate Modern’s Turbine Hall becomes the fantastic other world of an unfathomable ocean, where a scaled whimsical seahorse rises and quivers almost imperceptibly within the hidden undercurrents of the depths. Shafts of light ignite the blazing colours of swathed saffron wings and cerise body as its metamorphosis begins. 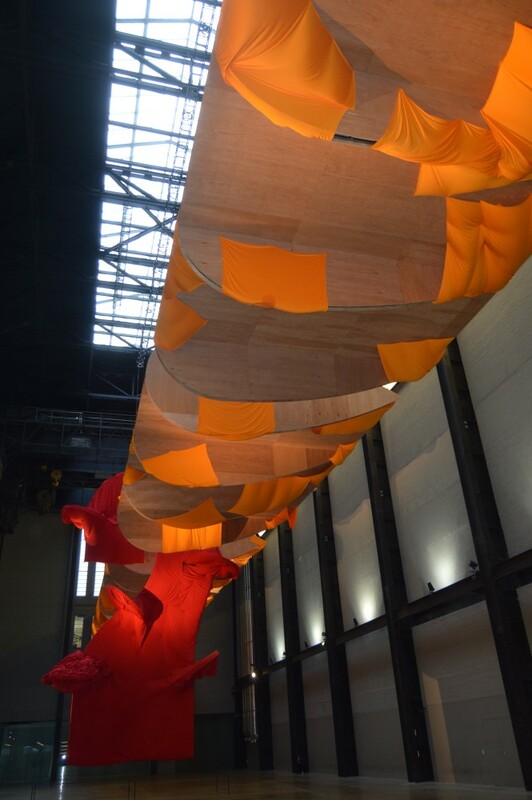 Loose woven material is randomly pinned along the partially covered rigid aircraft span that propels this creature and, while the body binding appears haphazard, it shrouds the central core. 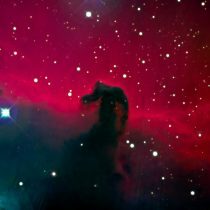 Engaging with the fundamental elements of the universe it may yet rise to soar beyond the earth and through the heavens until it reaches deep space where its shimmering silhouette rears, reincarnated, as the Horsehead Nebula. 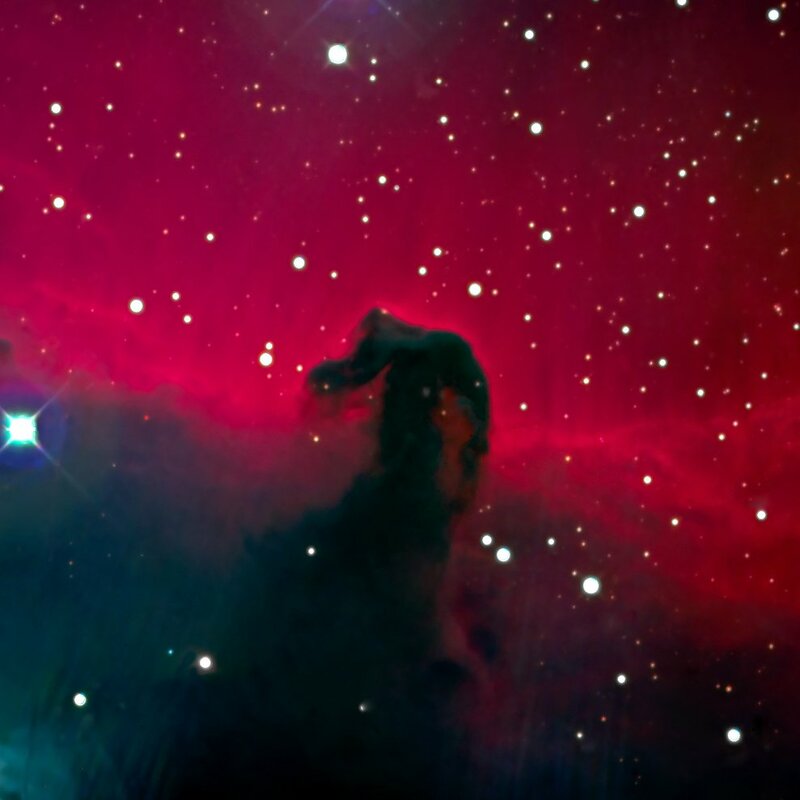 The fabric of life is spun though our insatiable unanswered questions persist. 14 October 2014 – 6 April 2015. 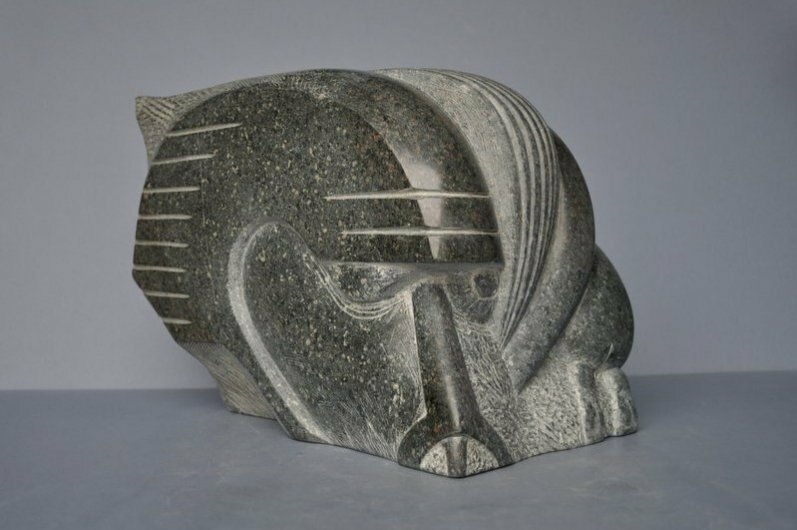 Inspired by his extensive travels, John Farnham’s direct carvings originate from cultural images, absorbed then seemingly forgotten until they are transformed into compact compositions in stone. John re-interprets figurative imagery to create distinctive sculptures. Mayan Family contrasts the masculinity and femininity of the historic peoples of Mesoamerica. 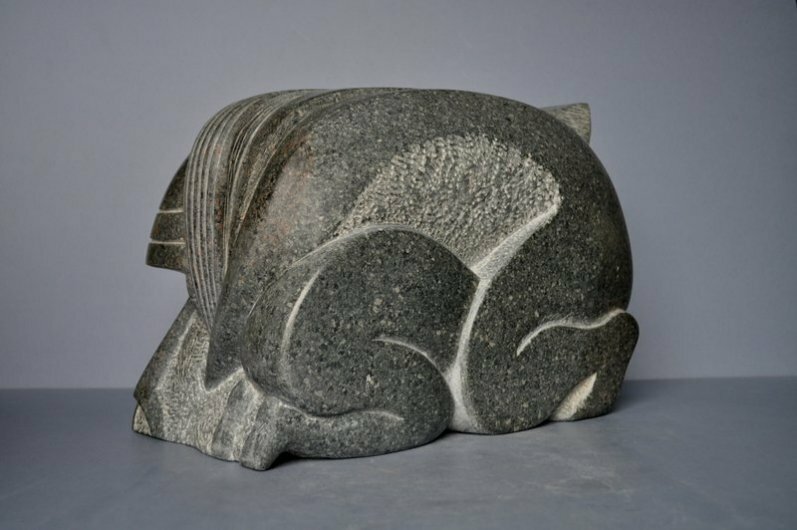 The semi-abstract heroic male head is covered with a polished helmet, bearing confident linear incisions which convey forward movement along the horizontal plane. The partial view of the upper face intensifies the determined outward gaze. The female shields a young child cocooned tenderly beneath her bowed body. Her unbound hair cascades to conceal her emotions, though her left arm extends to embrace her own protector. The silhouette of their rounded forms resembles the ancient picture-writing that influenced this carving. Though inextricably connected as a universal trinity, individual personalities and persuasions are implied by the differing proportional scale of each family member. 9 January 2015 – 27 March 2015. Provenance: Purchased on 9 January 2015 for a private collection. In October 1981, the Dean of Salisbury Cathedral, Wiltshire, wrote to his parishioners to inform them that ‘a new resident will be observed in the Close.’1 The initially temporary figure subsequently became a permanent inhabitant of the genteel eighteenth-century Cathedral Close. At the centre of the Close is a sizable lawned square, surrounded by historic houses, including the Queen Anne period Mompesson House, which is now owned by the National Trust. Walking south towards the pale, pollution-tinged, Cathedral, along the east side of the Close, a substantial white painted gate stands ajar. Within the Cathedral grounds, set on a truncated triangle of frayed and patch-worn grass, is the Walking Madonna. So slight that she is almost invisible – a mere shadow lost amongst the municipal clutter of four utility signs, the tall path light sited before the Cathedral porch and the apparently random rubble of large sandstone rocks on the east lawn. Her diminutive frame stands just less than 2 meters and is dominated by the scale of the Cathedral. Perhaps this tension of scale is a reference to humanity’s perceived insignificance against the presumed might of the Church. The dark patina of her bronze casting blends perfectly with the sombre gape of the huge perpendicular Gothic windows; her sun-tipped relief is lost in the reflected solar glint on the glass. 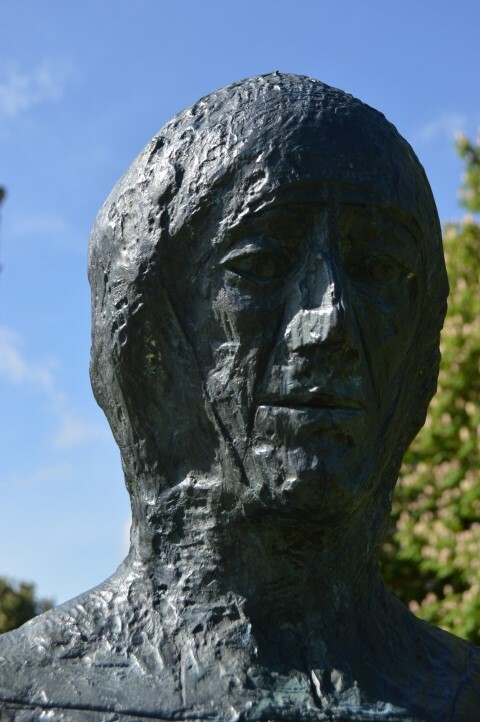 The tension of her suppressed anguish is visible in the slightest rise of her taut shoulders and grieving pinched-lip countenance; her modest demeanour echoes that of a nun, likened to Sister Raphael, the headmistress of the convent that Elisabeth Frink attended. The simplicity of the Madonna’s sackcloth textured clothing and waif-slender frame quietly proffers solace rather than chastisement for those who choose to meet her gaze or place their hand in her grasp-polished left hand. She is stilled by the depth of her thoughts, motionless, yet walking with resolute purpose. 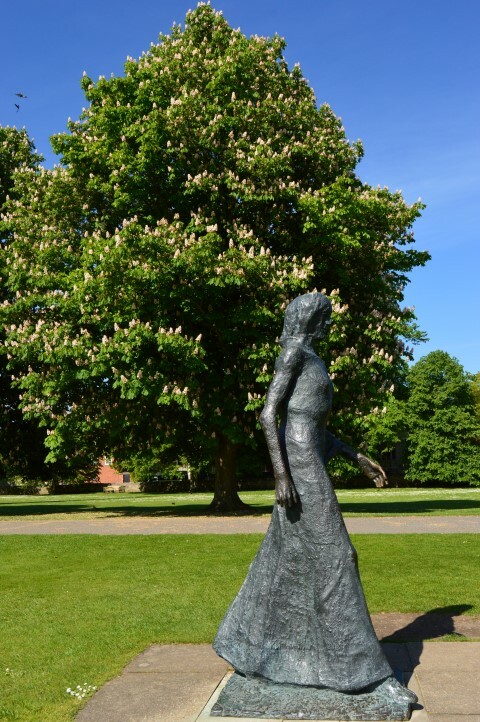 She strides forth into the Salisbury community, facing unexpectedly outwards, away from her spiritual home. Recognising that Mary, the mother of Jesus, is conventionally considered to be a member of the community, the remarkable decision that Walking Madonna was to be placed ‘moving out from worship to be where human needs are to be met, not just in Salisbury but in the wide world’ was taken.2 In making this decision the parish elders, probably unknowingly, redefined the principle that traditional ecclesiastic sculptures were set apart from their brethren. Here the Walking Madonna integrates with the crowds, allowing her to gain the community’s acceptance. Viewers engage with her presence. Her face is aligned almost at eye level for an adult of average height and because she is plinth-less, her hand is often held; she stands within – rather than loftily above – the congregation as they arrive for and depart from services. Her siting does not detract from any sense of reverence, nor has she been vandalised. She simply exists beside the tourists, the worshipers and the locals who use the Cathedral pathways as a short-cut. Those who take a moment to linger may appreciate this elderly lady’s grace; her slight form is powerfully engaging and, for the faithful, she may offer more than purely artistic appreciation. 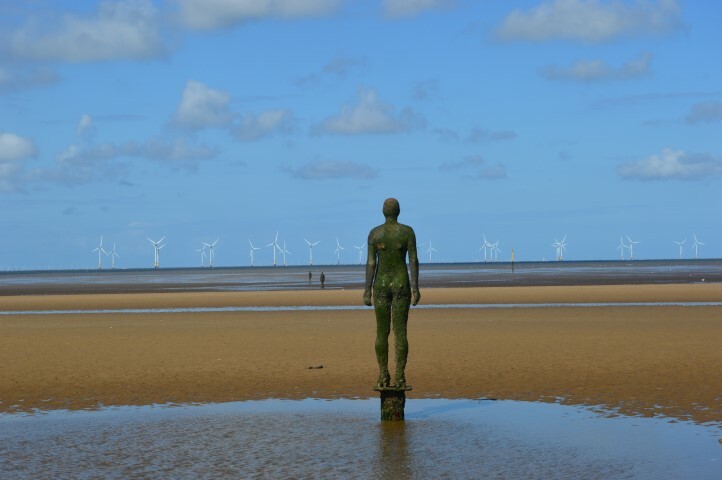 Crosby Beach is a vast open expanse animated by the passage of ferries, the whir of occasional helicopters and the constant raw screech of gulls spanning an icy blue sky. Children seek pond life through the clouds reflected in shallow pools of residual water and the breeze brings unbraided hair to life and noses wrinkle in response to the pungent, slightly rancid smell of seaweed. 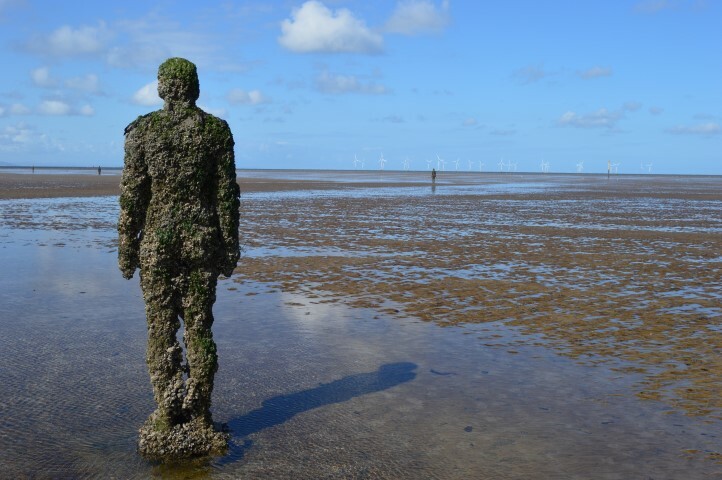 Here Gormley’s sculptures are rhythmically and eerily revealed and concealed by the perpetual tidal ebb and flow of unpredictable seas. Spaced apart, yet in visible distance to one another, their perpetually drowned and re-emerged bodies stand in mute witness to their surroundings. The distance between them varies between approximately 150 paces and 250 paces; some were re-sited when the installation became permanent. Seventeen different moulds were taken to create the 100 forms for Another Place, though the subtlety of each pose is perhaps difficult to perceive when walking from one to the next. The residual nubs of two casting rods remain slightly proud of each pierced chest, as if they were once shot through with parallel stakes. Beneath their feet, the shifting sands conceal the individual 1 metre pile foundations that hold each fast to the beach. Northwards the land is flat, interrupted by greenhouses before ultimately the distant spire of Blackpool Tower becomes visible. Housing, flats and uninspired municipal constructions along the eastward shoreline intermittently break the view beyond parked cars. Approximately ten miles to the south lies the Port of Liverpool, from which ferries take passengers to Ireland. At low tide the vessels’ distant progress appears disconcertingly land-locked, despite their disciplined routing through the deep water channel. Anticipating the end of the day the sculptures face west looking towards the huge wind turbines that proliferate in the Irish Sea. Figures placed farthest out of the bay crescent become fully submerged at high tide, then reveal as dark shadows to glisten above the receded water. Blanketed by barnacles, their mass has been altered as the space between arms and legs narrows. The sea’s claim is swift, and with each tidal cycle the deposits grow minutely in girth. Their once sharp silhouettes have been crinkled into an almost leprotic skin. Cutting and textured, the previously smooth men of iron have been transformed by immersion, to be cocooned within marine life from the brutality of each gale that rages against their collective stance. Those closest to the shore remain truer to their original cast. Some have their identification numbered bracelets still clearly visible, entwined around their left ankle or right wrist. 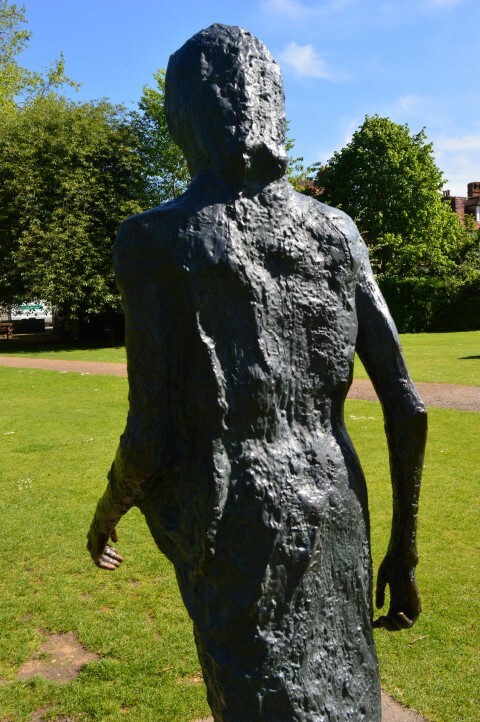 Although they are, as art critic William Mitchell has articulated, ‘intractably coded as biologically male, their postures evoke the “feminine” codes of passivity, vulnerability, abjection and receptivity.’4 All appear melancholic, even on a sunny summer’s day. Perhaps a metaphor for man’s daily struggle: they await the tormenting torrents, yet they stand stoically. As a crowd they include the viewer as participative. 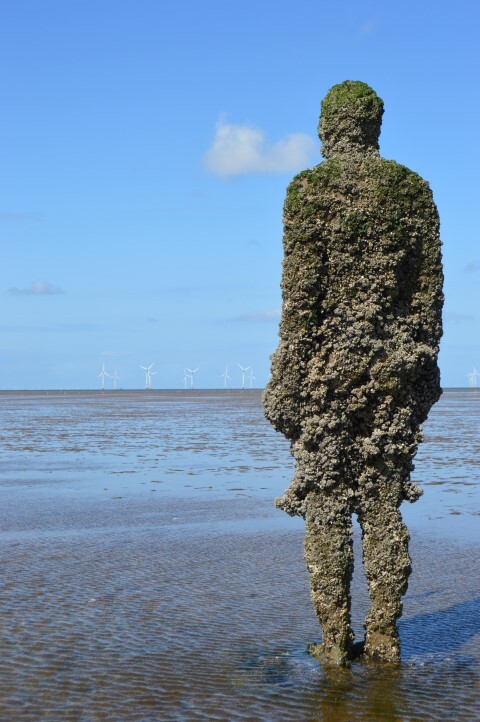 Realising Gormley’s wish, Another Place is available to everyone and has brought a much needed economic tourist boost to the area. Their forms have been gleefully dressed in clothes and Christmas hats, used as a backdrop for the ballet, engaged young children who walk along the beach waving to as many as their parents’ patience will tolerate, been a magnet for those seeking solitude, and a celebration of life included in memorable photographs of family and friends.5 Yet walking between these entranced figures, there is a darker feeling too, a sense of isolation, despite their seeming companionship. A kaleidoscope of facets define this populated landscape and however the viewer chooses to interpret the ambience of the environment, anthropomorphic projection is precisely what heightens the attraction. Another Place has made this once forgotten arc of the North-West of England memorable, entertaining and profound, while simultaneously removing the sceptism of whether art can be shared by all. 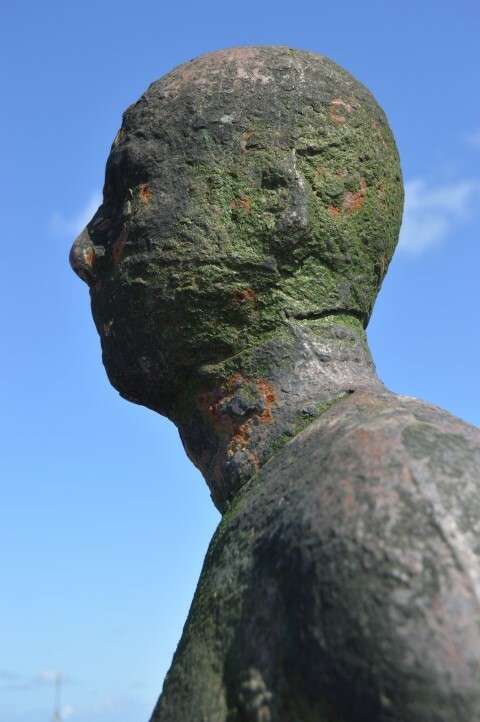 Declan McGonagle, Director: Irish Museum of Modern Art, credits Gormley for his rare ability to engage with the civic approval process to place his sculpture in public spaces. 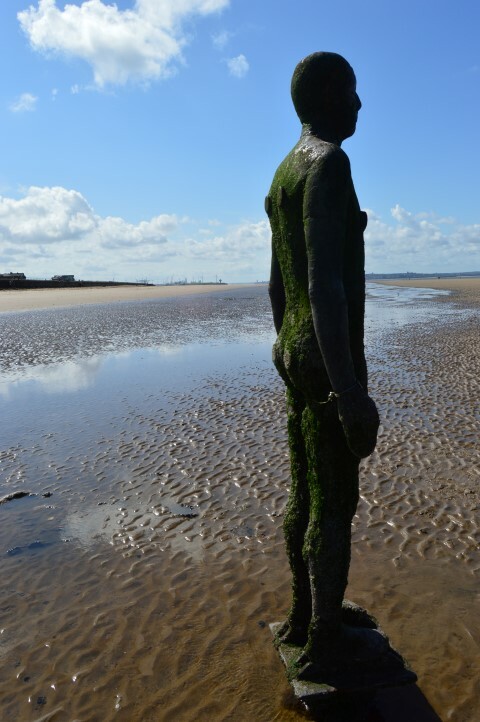 Gormley’s apparent tranquillity and patience might be attributed to his Buddhist philosophy.